Get out of town with these interesting Brisbane side-trips: Warner Bros. Movie World (in Oxenford), Surfers Paradise (SkyPoint Observation Deck & Surfers Paradise Beach) and Sea World Theme Park (in Main Beach). There's still lots to do: walk around South Bank Parklands, look for all kinds of wild species at Lone Pine Koala Sanctuary, take in nature's colorful creations at Roma Street Parkland, and find something for the whole family at Wheel of Brisbane. 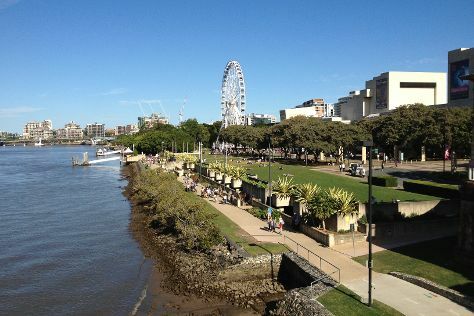 For more things to do, other places to visit, maps, and more tourist information, refer to the Brisbane trip itinerary maker . London, UK to Brisbane is an approximately 25-hour flight. You can also do a combination of flight and bus; or do a combination of flight, bus, and train. The time zone difference moving from Greenwich Mean Time to Australian Eastern Standard Time (Queensland) is 10 hours. When traveling from London in September, plan for a bit warmer days and about the same nights in Brisbane: temperatures range from 28°C by day to 15°C at night. Cap off your sightseeing on the 21st (Sat) early enough to travel to Port Douglas. You'll find plenty of places to visit near Port Douglas: Cape Tribulation (Daintree Rainforest - Cooper Creek Wilderness, Myall Beach, & more), Palm Cove Beach (in Palm Cove) and Alexandra Bay Waterfall (in Diwan). Spend the 22nd (Sun) among aquatic life with a scuba or snorkeling tour. Spend the 23rd (Mon) spotting exotic species with a safari tour. There's lots more to do: experience rural life at Hartley's Crocodile Adventures, kick back and relax at Four Mile Beach, don't miss a visit to St Mary’s by The Sea chapel, and get to know the resident critters at Wildlife Habitat Port Douglas. To see where to stay, maps, ratings, and other tourist information, refer to the Port Douglas travel route planner. Do a combination of flight and shuttle from Brisbane to Port Douglas in 6 hours. Alternatively, you can do a combination of bus, flight, and shuttle; or drive. Traveling from Brisbane in September, expect Port Douglas to be a bit warmer, temps between 33°C and 22°C. Finish your sightseeing early on the 27th (Fri) so you can travel back home.